Evoking the sun whose worship affected many aspects of life for the Incas is this hand painted ceramic pendant from Peruvian artisan Dina. 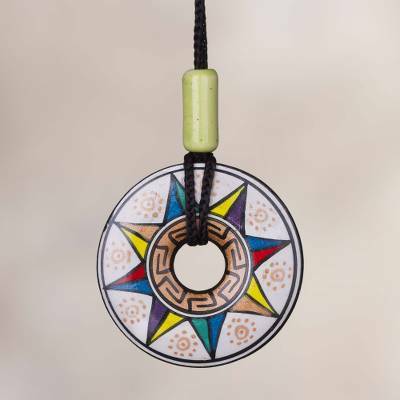 Sun rays in red, turquoise, yellow, and purple stream out from the center of the doughnut-shaped pendant which is also decorated with a ring filled with fretwork. Suspended from nylon cord, the divine pendant is topped with a tubular bead in light green. "Beautiful pendant - wonderful colors"
Dina - Thank you for this beautiful work of art. This pendant was purchased to turn into something new...an ornament to display in my home. I don't need more necklaces, so I look for unique pendants to turn into Holiday ornaments - or to hang in my windows. It is perfect - I found very special personal symbolism in this piece. Pendant is great/ colors are bright and design is bold. Style is intriguing, too. But the corded necklace doesn?t work with the pendant because you cannot easily (or at all?) shorten the cord and the yellow clip falls off if you try to adjust cord length. The cord hangs way too low for the size of the pendant. This is an absolutely wonderful item and I love to wear it. It only just arrived today and I've not taken it off once. Thank you, Dina, for crafting a wonderful item to wear, its colour radiates out against light and dark fabric alike and makes it as bright as the sun itself.